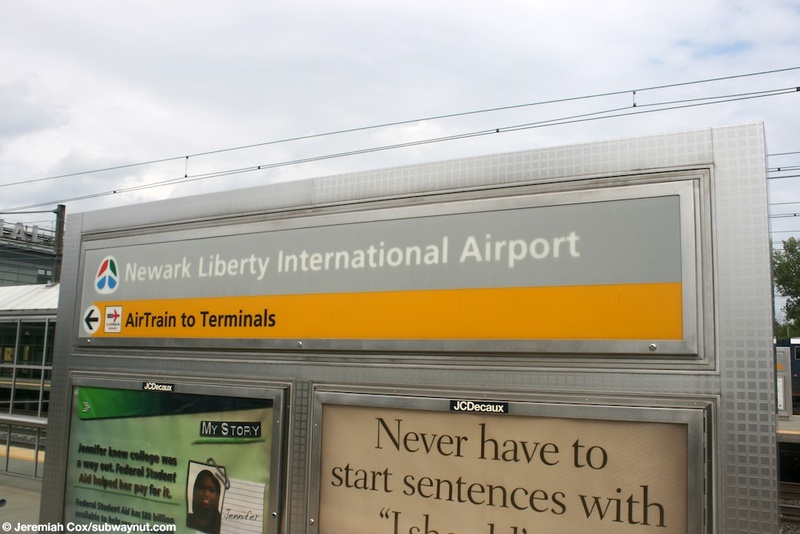 The Newark-Liberty International Airport Rail Station (yes that's how New Jersey Transit's automated announcements announce it, Amtrak lists it as Newark, NJ - Airport on their station lists, and as Newark Liberty Intl. Air, NJ) is one of the most unusual I know off. 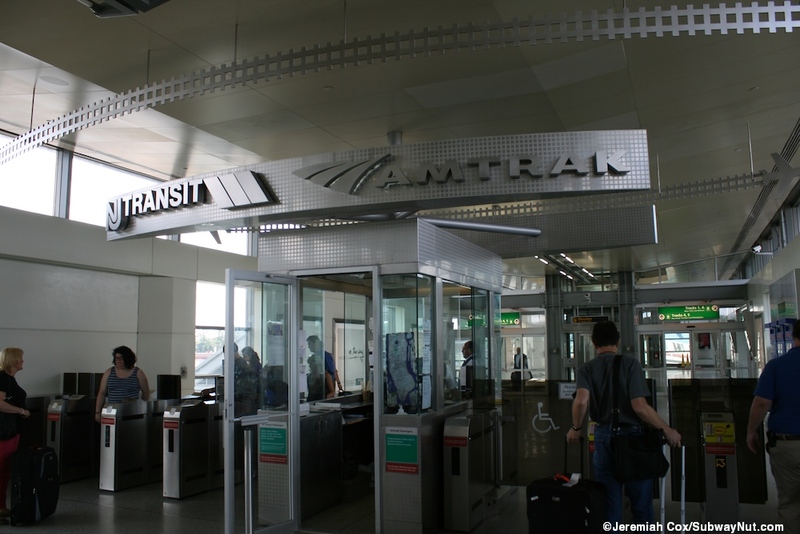 To access it all passengers must leave by either Amtrak or NJ Transit Train or the Airtrain Monorail. You can't exit to the street, there just emergency exits. 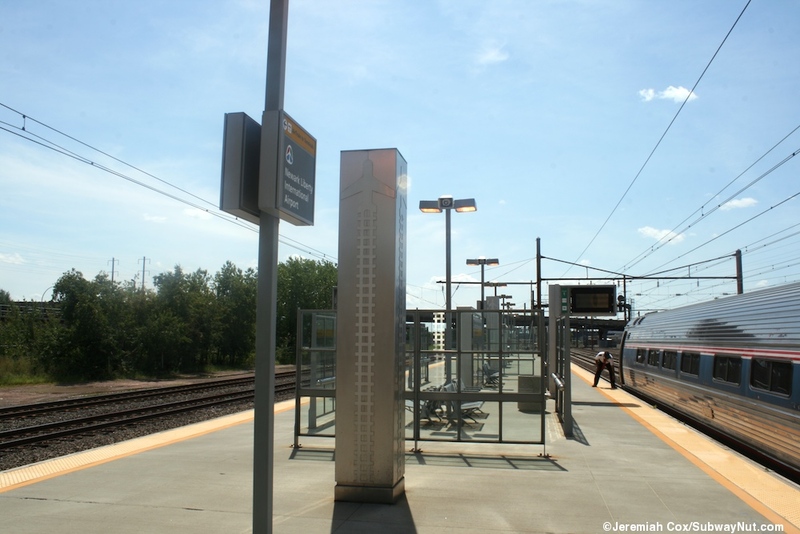 The stop opened, as the first Rail to Plane intermodal connection on October 21, 2001. 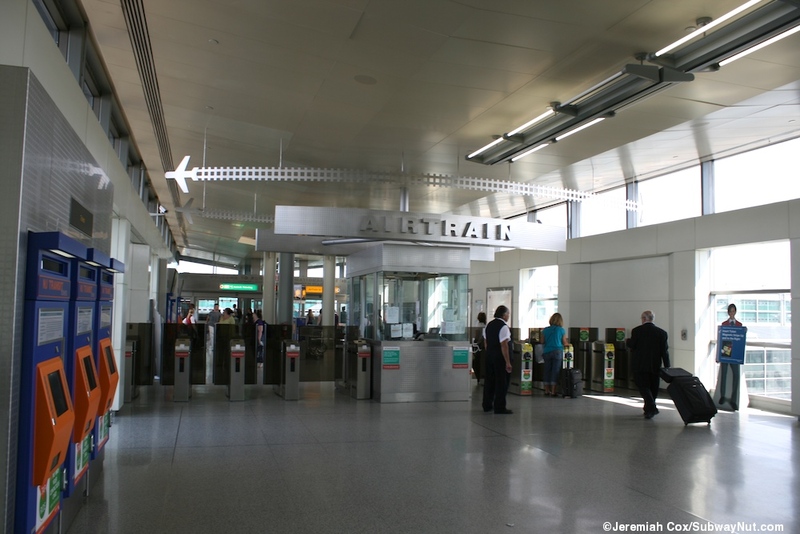 A special $5.50 AirTrain fee is collected for using the station. 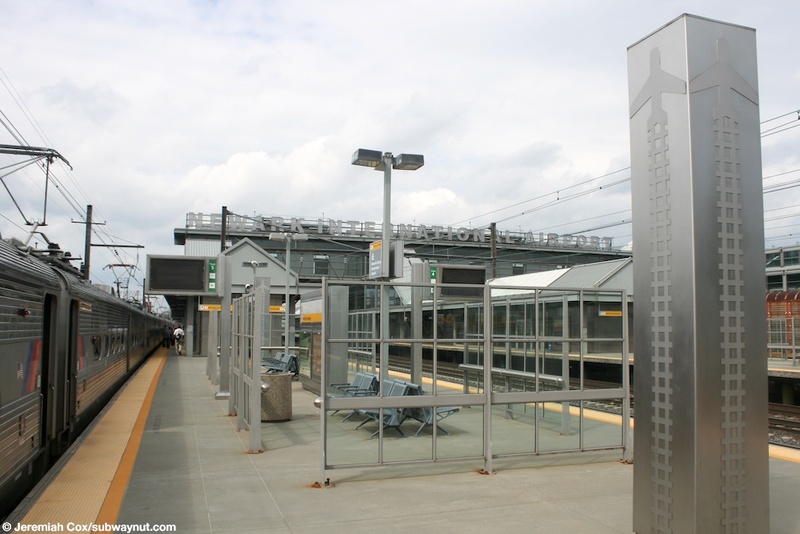 All New Jersey Transit tickets with ***EWR*** printed on them are successfully read at the fare gates. 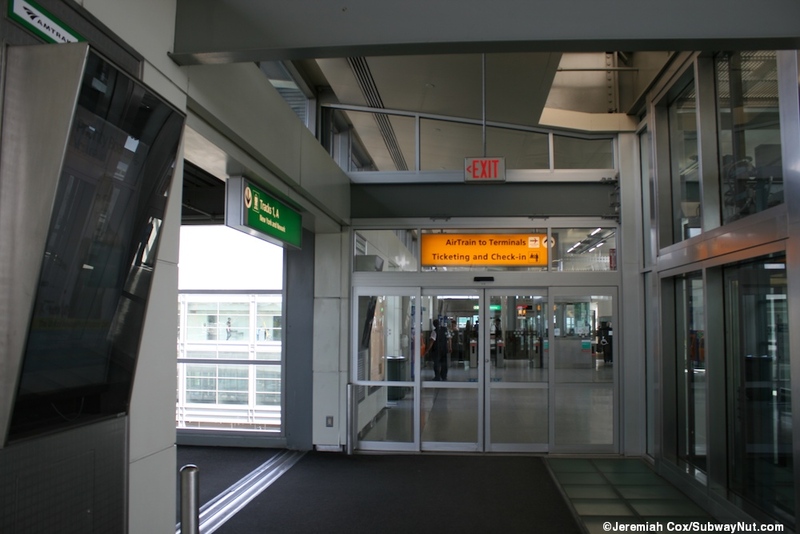 Passengers with any tickets that aren't coded to EWR must buy a special ticket for the fare gates from Vending Machines before them by the rail platforms. Amtrak tickets are shown to a Port Authority Red Coat to pass through the station. United Airlines also has a codeshare agreement with Amtrak. It sells direct tickets (sometimes with different fares that are lower than starting at the airport. I did a test search to Denver for October 10, 2012 on August 13, 2012 to show this). 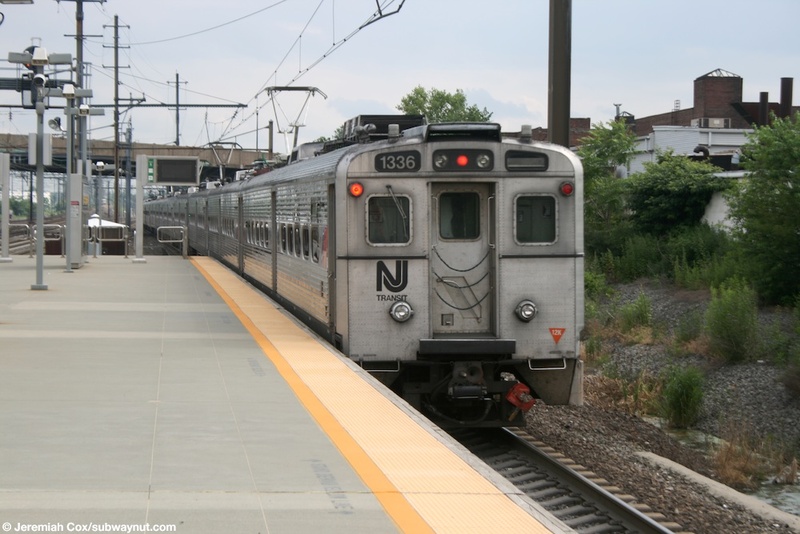 The regular non-stop fare is $254) to New Haven (IATA code ZVE, $230), Stamford (ZTF, $354), Philadelphia (ZFV, $280), and Wilmington (ZWI, $404). 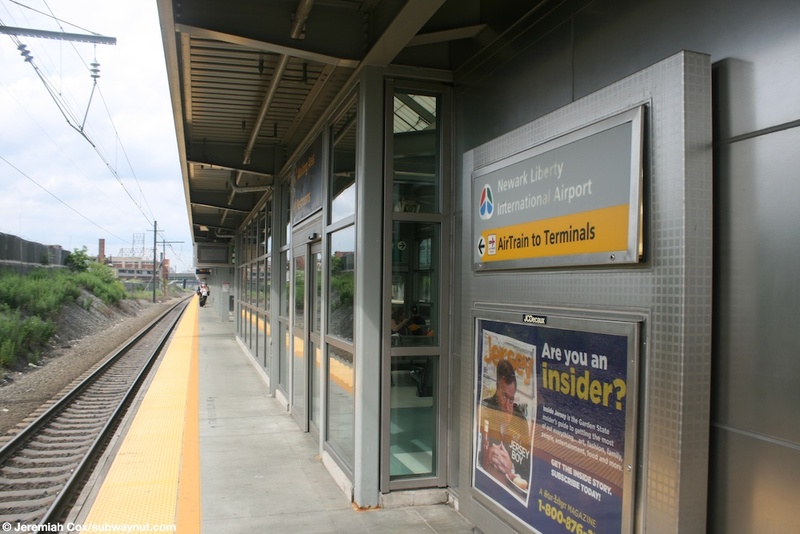 The Continental Airlines website (before the merger) for years had a note saying to take Airtrain Newark to the Airport beneath any ticket booked to and from Newark. It seems to have disappeared post-merger. 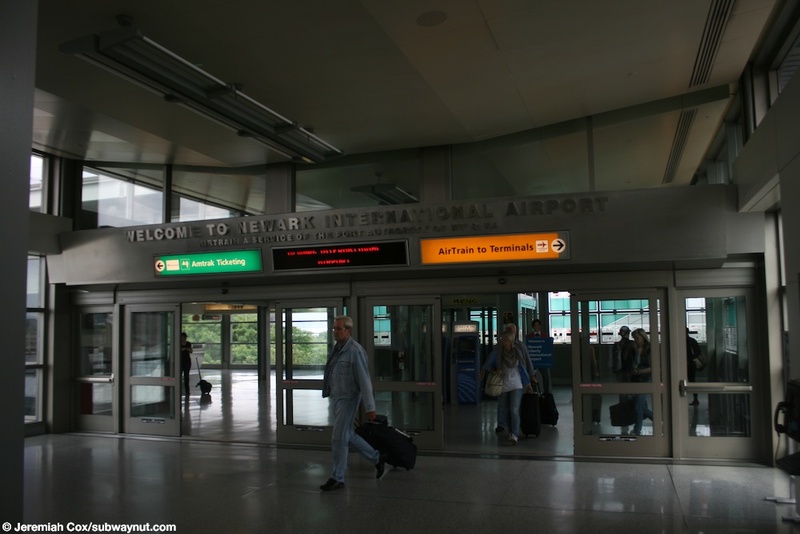 This actual fare (and $5.50 fee being charged) to the airport is also quite ambiguous, from a personal experience I was going from Harriman (in New York State) to the Airport to catch a flight on a trip in June 2010. The website claimed the fare is $18.25, the TVM only wanted and charged me $12.75, the fare minus $5.50 (the Airtrain fee). I thought I had underpaid, and the ticket just didn't include the Airtrain fee. My ticket though it was successfully read at both the fare gates at Secaucus, and EWR and let me out to board the monorail. 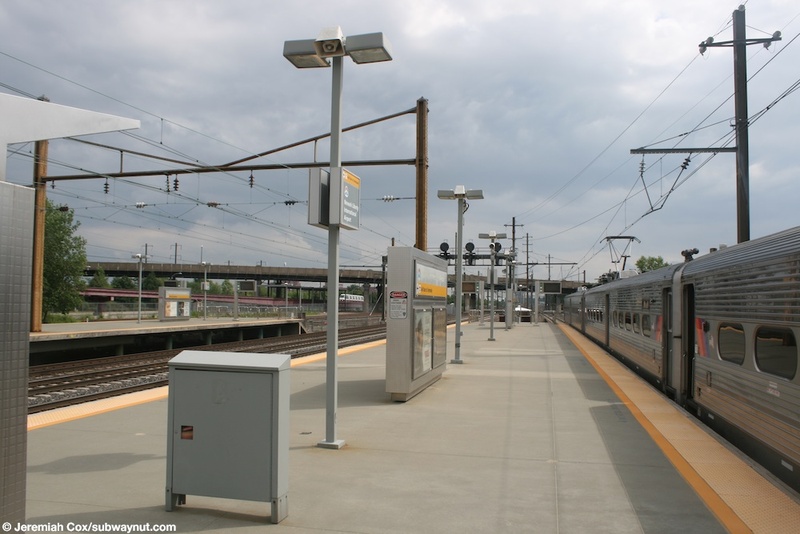 For service the stop has two New Jersey Transit Trains per hour at a minimum stopping (most hours three), two on the Northest Corridor and one on the North Jersey Coast Line. Amtrak serves Keystone or Regional train stopping every hour. Amtrak treats the stop as any other (it seems) and the second time I visited there were no extra Airtrain fees, on a slightly less than 3 hour stopover. Amtrak passengers have to flash their ticket, ticket stub (pre eTickets) and now with eTickets simply show proof of having a ticket on a train. The agent (much to my surpise) read my iPhone totally fine as I was getting off. I did reprint my paper ticket to have the Airport segment as my boarding destination when I got on. I don't know if Amtrak paid the Port Authority $11 for my joy ride use. The station has a very large number of, six electrified mainline NEC tracks going through the station. Starting at the western side of the station there are two tracks with an island platform, track B and 4, used by Southbound (Trenton, Philadelphia and Bay Head-bound trains). Then there are two middle track that don't platform for expresses. After that another two tracks with their island platform used by trains to New York. 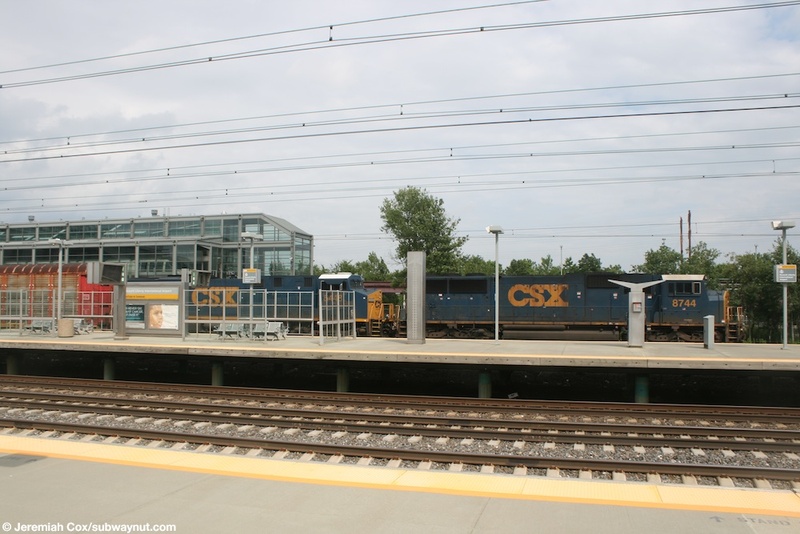 Finally after are two un-electrified tracks at the western end of the station used by CSX freight trains. 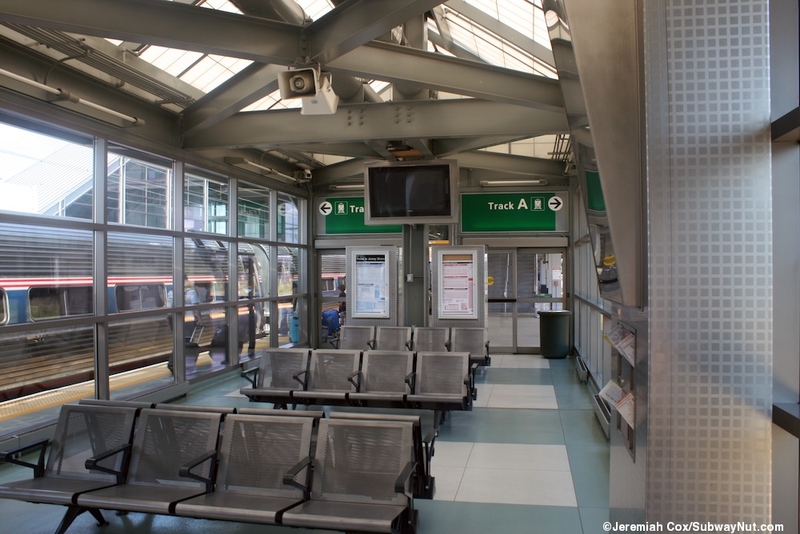 Each platform contains two enclosed (with automatic doors outside and nicely heated) large waiting areas with plenty of seating and two single restrooms (open from 5am to 10pm). 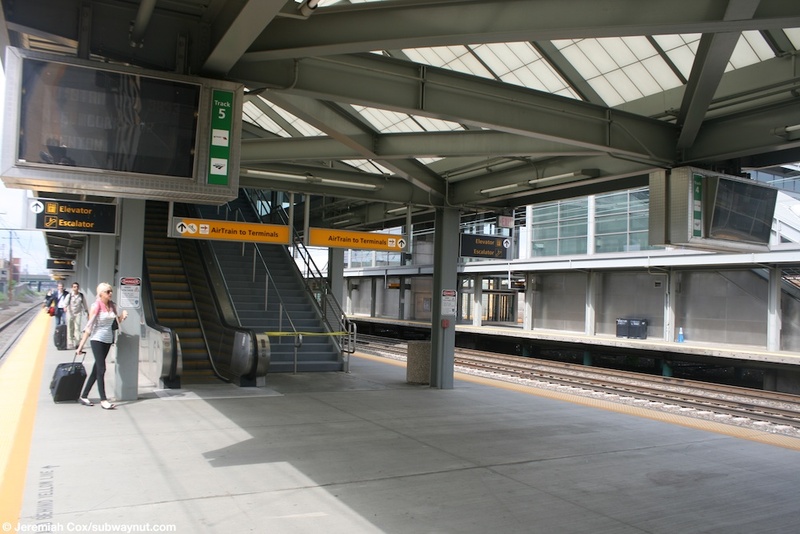 Towards the extreme ends of each platform are more benches after the canopies have ended surrounded by six foot tall glass windscreens. On their own slightly higher level is are two monorail tracks at their island platform station. 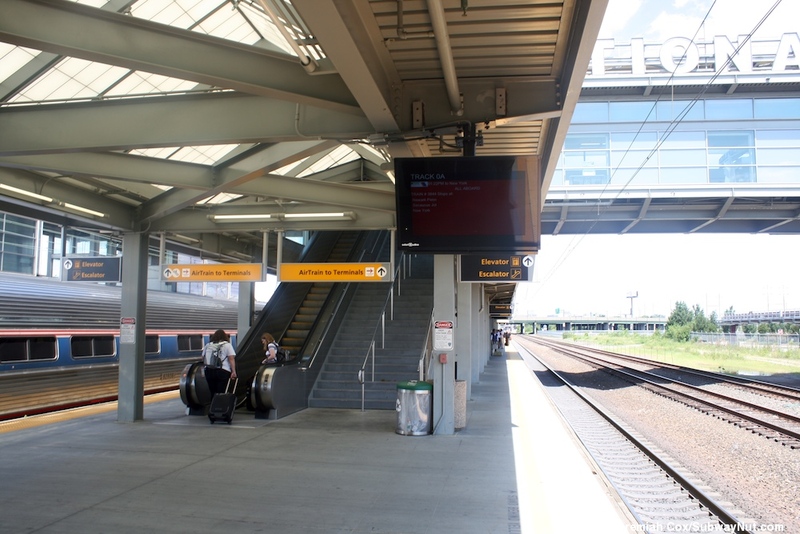 Connecting these platforms is a glassed mezzanine level bridge that has Newark International Airport lettering on either side of it facing the train tracks. There is a single elevator bank and two up escalators/staircase banks to this level from each platform. 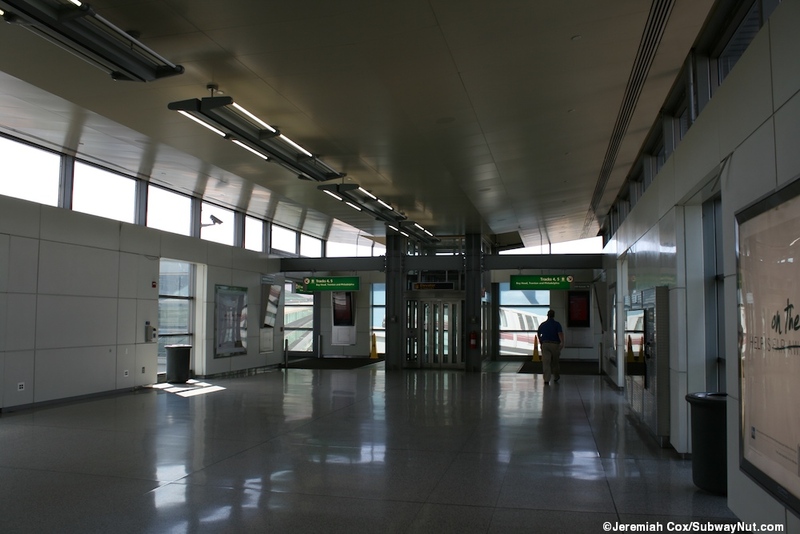 From here on the west side of the overpass are the fare gates with an area in between for the PANYNJ Red Coats that run the station and are stationed at each AirTrain Station to provide information. 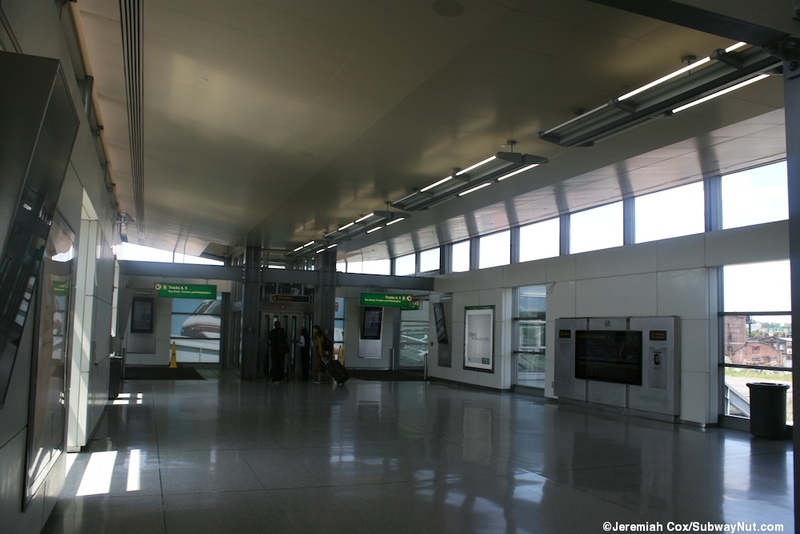 Reaching the Airtrain area are two Continental Airlines check-in kiosks, and a larger than necessary ticket counter with an Amtrak agent, along with NJT vending machines (No NJT ticket agent). There is also a Ducken-Donuts Express. Two short escalators with a staircase in between lead down to the monorail station. This station has an island platform with the monorails switching between the two tracks before the station and only using one side of the platform (the one facing the train station's platform) to actually stop, there's a nice view of trains using the ridiculously large monorail switch right before the station. The ride to the airport feels extremely slow on the monorail with the trip to Terminal C (the closest terminal) taking 7 minutes, with 9 to B, and 11 to E. The distance to Terminal C by the monorail tracks is one and a quarter miles, meaning the monorail averages a speed of only about 10mph, this is a far cry from the fast speeds of AirTrain JFK's Light Rail as it runs above the Van Wyck Expressway. The next train signs are just LED signs (unlike the LCD monitors that JFK now has). 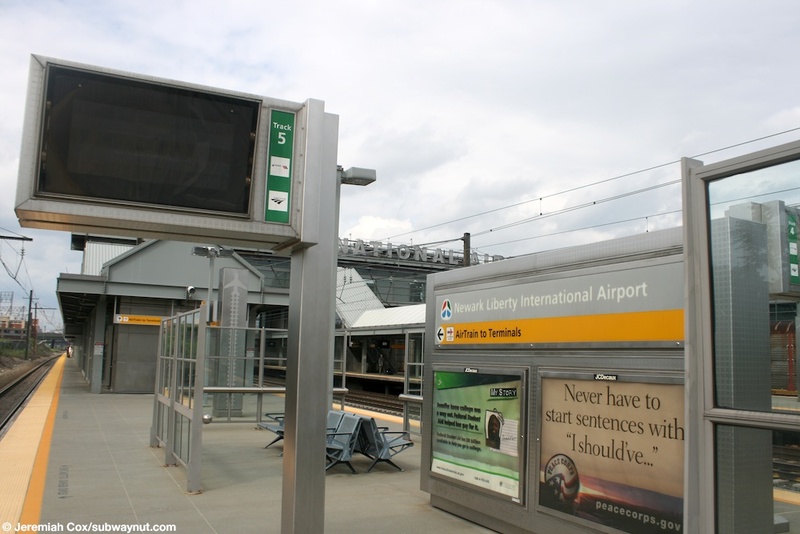 All the station signage, including those on the platform is in the Port Authority's unique Yellow (departing), Green (arriving), Black (general) format that they use at all their airports. 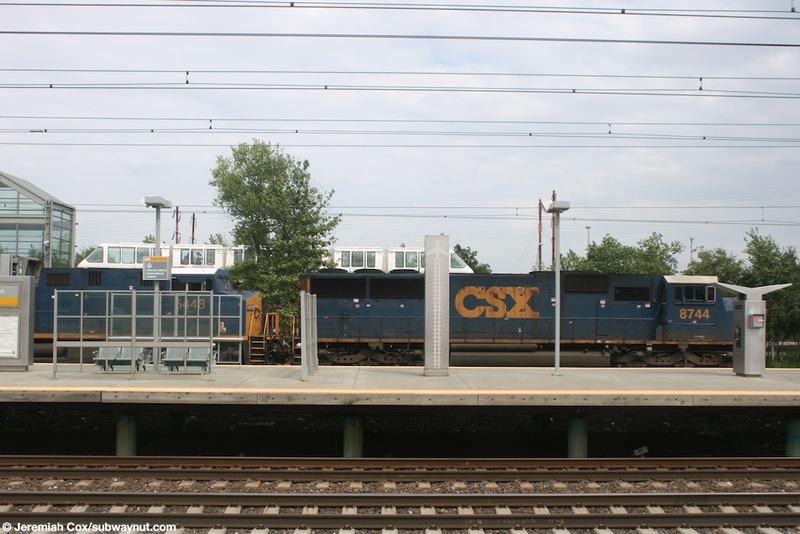 Two forms of transit that don't intermingle too often, two CSX Locomotives ES44DC #5448 & SD60I #8744. A Mk III Monorail Trainset #5 is behind it. 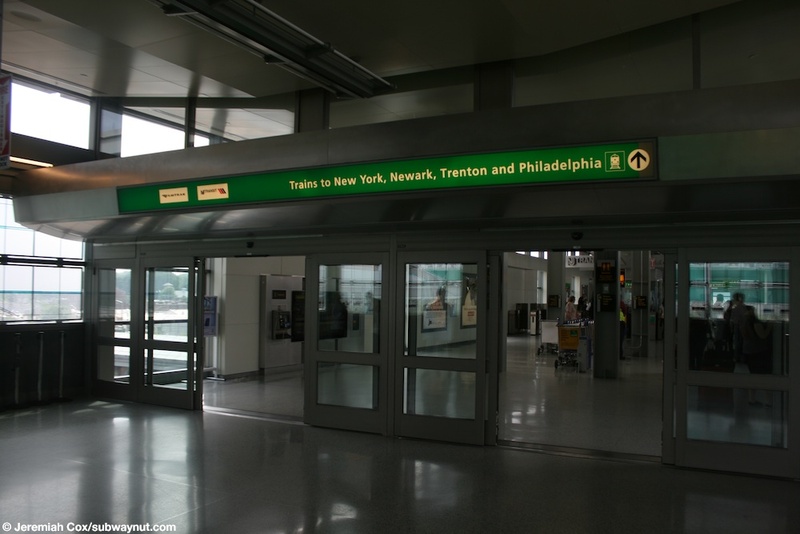 One of the track information monitors on track 5 at Newark Airport, NJT and Amtrak logos are on the side of the sign.